Add some kick to this spicy spinach dip with diced tomatoes and green chilies. 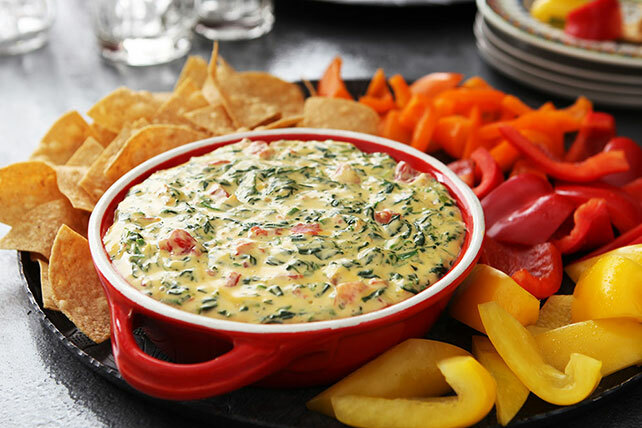 VELVEETA® Spicy Spinach Dip is a fabulous way to entertain with flair. Place spinach in large microwaveable bowl. Microwave on HIGH 5 min. Microwave 5 min. or until VELVEETA is completely melted and mixture is well blended, stirring after 3 min. If your guests like a little extra heat, fire up their taste buds by preparing this creamy, zesty recipe with RO*TEL Hot Diced Tomatoes and Green Chilies, and Jalapeno VELVEETA. Prepare using 2% Milk VELVEETA and PHILADELPHIA Neufchatel Cheese. Cut ingredients in half. Mix in 1-qt. microwaveable bowl. Microwave on HIGH 3 to 4 min. or until VELVEETA is completely melted and mixture is well blended, stirring after 2 min. Serve as directed. Makes 12 servings, 2 Tbsp. each. Serve with cut-up vegetables and/or tortilla chips.